Somewhere in the first half of David Lowery’s A Ghost Story, there is an uninterrupted seven-minute sequence of Rooney Mara eating a pie. No, seriously, that’s all that the scene contains; it is just Rooney Mara scoffing down an entire pie until she is literally sick, while Casey Affleck looks on in the background wearing a ghost sheet over his entire body. There is no dialogue in this scene, no other characters, no more than two unbroken long shots, and it’s not even a moment that comes into play at any other point in the movie; it is just Rooney Mara eating this pie for seven straight minutes, and nothing else. It’s an absolutely ridiculous concept – and yet it’s one of the most memorable sequences I’ve seen so far this year. It’s also a perfect way to sum up A Ghost Story in a nutshell; it’s a concept that could be rather draining and stupid in the wrong hands, but it’s oddly fascinating and subversive to a point where it’s all you can think about for ages afterwards. The set-up is that Affleck and Mara are a (nameless) couple who are perfectly happy together, but when Affleck suddenly dies in a car accident he is left wandering the Earth – or more specifically, his house – wearing only a sheet with eyes and watching over Mara overcome her grief, including with the aforementioned pie. Things spice up, however, when ghost Affleck starts experiencing several new occupants of the house when Mara finally decides to leave, which to him feel like just seconds, and soon he goes on a short voyage that takes him across time whilst remaining pretty much in the same vicinity at all times, and once things come full circle at last (without too much in the way of spoilers), the movie ends. It’s startling simple, yet surprisingly complex and deep in its ideas of time and legacy, and unlike Song to Song it has a definitive focus and doesn’t over-indulge too much in its arthouse credentials (thank God). Having said that, though, the entire film is presented in a 1:33:1 aspect ratio (basically, a square with the edges rounded off) which really allows you to feel the claustrophobia of essentially being trapped in a single space the entire time, and also the emotions presented in the tight close-ups on actors’ faces. Lowery is clearly a fan of this aspect ratio, and manages to create such an alluring and also perplexing portrait with such little canvas space as though it were no big deal, something that he and cinematographer Andrew Droz Palermo achieve with understated beauty. Academy ratio films are hard to come by nowadays, but whenever they do tend to pop up they always manage to find a way to feel unique and special in an era of widescreen. The film requires a LOT of patience for you to get the most out of it, and it’s not hard to see why some people would be turned off by its slower pace, especially in that first half, but the reward for sticking through it all is a subversive and eerily beautiful tale about love and loss, and how the stuff we leave behind or let go can so easily be lost to the very nature of things. There is another extended sequence – don’t worry, there’s actual dialogue in this one – at a house party where a guest goes on a nihilist rant about how nothing humanity does will even matter, since in a few billion years the planet will be swallowed whole by an expanding sun. In this scene, while the message and how it is delivered is surely intended to be depressing, the film’s themes about leaving behind a legacy to be remembered by is made even stronger, because even if billions of years from now the Earth is no more, it’s just extra incentive to embrace the way things are right now, so that mere years down the line we will still have something from our past to cling on to as a reminder of how, even in our heavily flawed existence, there are still footprints embedded into the ground among us. Lowery is smart to approach such a deep topic in such an unconventional way, one that’s as far away from the Hollywood system as he can get, because if A Ghost Story had been told using the same familiar tricks we’re so used to like quick-cut editing or feeling the need to go on for paragraphs of dialogue just explaining the plot, it wouldn’t have been nearly as unique. Lowery is slowly becoming one of those filmmakers whose talents can be put to good use in smaller independent films like this and Ain’t Them Bodies Saints from a few years ago, and even higher-budgeted films like last year’s Pete’s Dragon remake, and so far he’s made quite the impression with two very different types of audiences, a feat that can usually be lost in translation thanks to studio interference. But like with Pete’s Dragon last year, as long as Lowery is left to his own devices he can make a film that’s stunning in its simplicity and also rich in its themes and emotional factor without going too overboard with it, and A Ghost Story shows that he can easily slip from big-budget Disney film to a $100,000 indie film about a ghost sheet wandering about a house without it feeling like creative whiplash. He’s a very talented director, one who knows exactly what he’s trying to accomplish and executes it in a way that you honestly haven’t seen in quite a long time, making it a truly unique and one-of-a-kind experience. 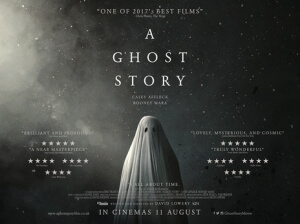 It’s certainly not for everyone, and if you’re easily bored by this film I will completely understand why, but I found A Ghost Story to be a truly sticking film that I’ll be thinking about for a while. But next time, maybe at least have Rooney Mara scoff down something a little less fattening? A Ghost Story is striking in its simplicity and also its calm execution of such complex ideas such as time and legacy, and is a gorgeously made supernatural drama that is certainly not for everyone, but those who stick with it will be rewarded with something truly unique and special.